GWAAC is carrying blood on the helicopter and rapid response vehicles which will benefit seriously ill and injured patients in need of emergency blood transfusion. 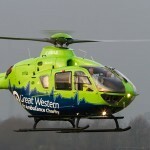 The charity has teamed up with Wiltshire Air Ambulance (WAA) to fund the initiative. WAA is also carrying blood on its helicopter. This means that the two air ambulances are the first in the south west of England to carry blood. It is estimated that this will benefit 2 – 4 patients a month. Emergency blood transfusions are likely to be used on patients who suffer life-threatening bleeding caused by trauma and some acute medical conditions. The blood will be collected daily from the North Bristol Trust Transfusion Laboratory at Southmead Hospital and delivered to GWAAC’s airbase in Filton and WAA’s Operations Centre in Devizes by the charity Freewheelers EVS, which covers the south west. Additional deliveries can be made if required by the air crews. If the blood is not used, it will be returned to Southmead Hospital by the volunteer blood bikers after 24 hours. The blood storage boxes maintain the temperature of the blood within in very narrow limits for well over 24 hours. Any unused blood units are therefore able to be put back into the Southmead Hospital blood bank, preventing waste. “Delivering blood supplies to air ambulances is a new venture for us and we are delighted to be working in partnership with Great Western Air Ambulance and Wiltshire Air Ambulance. The blood, two units of O negative, will be stored in a Credo blood box, an insulated box that maintains the blood within a narrow temperature range preventing damage and spoilage. When blood is to be given to a patient it will be warmed from its cool storage temperature towards body temperature using a small portable device called a Belmont buddy lite Fluid Warmer. The Credo blood box containing the units of blood can be switched from the helicopter to the Rapid Response Vehicle (RRV) used by GWAAC and WAA Critical Care Paramedics, if needed.